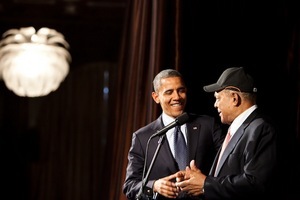 The President and Willie Mays. Photo by Moanalani Jefferey. This isn’t exactly a typical starlet sighting, but since we’re talking about El Presidente, we can make an exception over here at Hopper HQ. Last week, Janet and Clint Reilly held a sold-out, reelection fundraising event at the Julia Morgan Ballroom in honor of President ~Barack Obama~, and Credo’s executive chef Gustavo Romero Veytia was in charge of cooking for the 250-person luncheon. On the menu: summer salad with upland cress, red frilly mustard greens, watermelon, and plum vinaigrette, and an entrée of grilled coho salmon with sea beans and baby purple artichokes in a lemon-caper sauce. Also present at the luncheon: ~Willie Mays~!